The goal of the Windward Chapter of the National Art Honor Society is to inspire and recognize those students who have shown an outstanding ability in art. 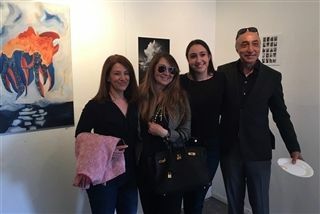 Thanks to Windward parent, Sofia Wolpert (mother of Tessa Wolpert '19), who helped Windward find a space, the Visual and Media Arts department was able to host an off campus event honoring the NAHS students' impressive array of artistic endeavors. The show was filled with sculptures, videos, animations, photographs and mixed media works, showcased in Studio 106 LA at the Barker Hangar in Santa Monica on Sunday, May 7. It was a special day of art, food, and community, with the goal of bringing the incredible work of Windward students to the attention of the School and beyond. "We hope to continue this tradition of off campus art shows with the goal of celebrating the hard work and creativity of our students!" said Art teacher Christina Hendershaw. Click here to view more photos from Sunday's show.